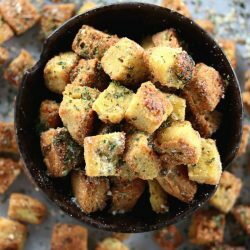 These delicious Garlic Croutons use the 90 second bread recipe, are entire gluten-free and low carb! 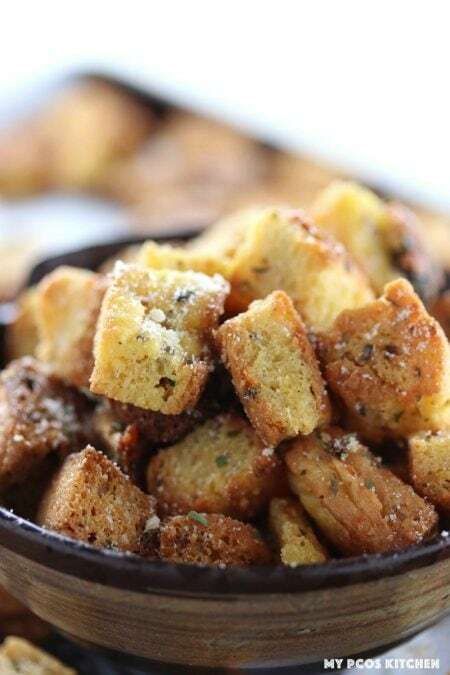 Homemade garlic croutons are the best thing that will happen to you today! Seriously, you have to make this recipe! Once you make it, you’ll understand why I say it’s seriously the simplest of recipes! 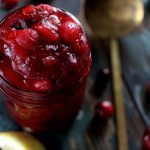 I made a huge batch of them this week and have been using them on all of my salads and soup for the week! They can be a little addicting if you’re looking for a crunchy snack so be warned!! I sometimes snack on pork rinds when I feel like eating chips, but these littles guys here can be the perfect substitute! This recipe for garlic croutons actually uses the 90 second bread recipe. If you’ve never tried it, you must! If you make it in a mug, you can have yourself a nice gluten free English muffin ready in less than 2 minutes! You can use any type of heat proof dish to make the 90 second bread. For this recipe, I just used a square Tupperware because I wanted my croutons to have a square and even shape. I have made this garlic croutons recipe before in a mug, but not all the croutons ended being the same side so I much prefer making it in a Tupperware. Now I actually doubled the recipe because I wanted to make a decent amount of low carb croutons. I microwaved my recipe for 3 minutes total and that was more than enough time to make these gluten free croutons! 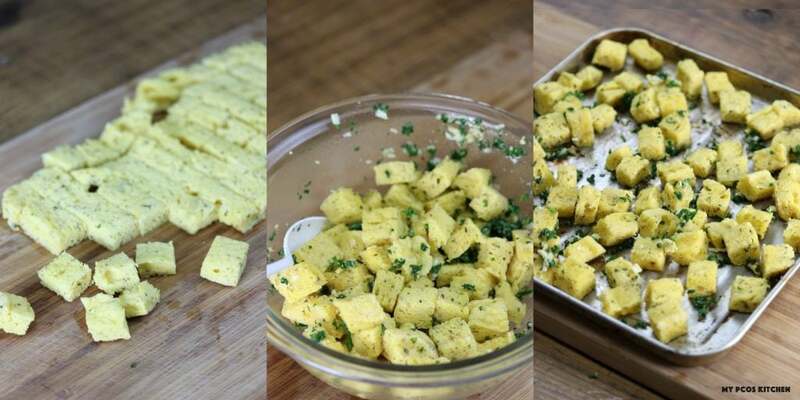 Making homemade croutons is actually pretty simple! Once you have made your gluten free English muffin, you just need to cut it up into cubes the size of your choice, add the seasonings and butter, cover everything in it and toast it for a few minutes! 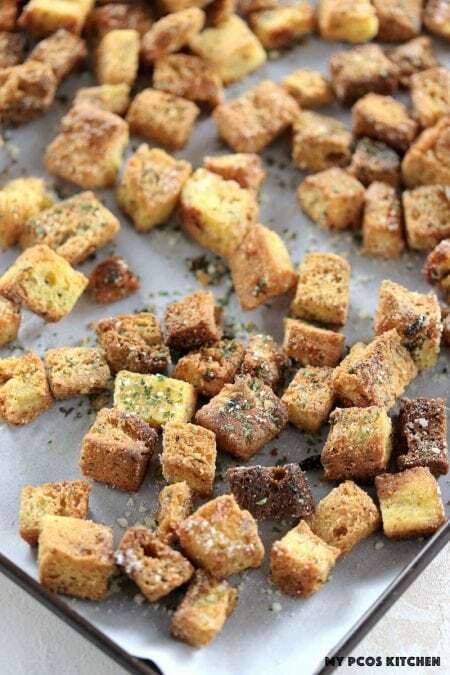 You can season these homemade croutons with any combination of spices you want! 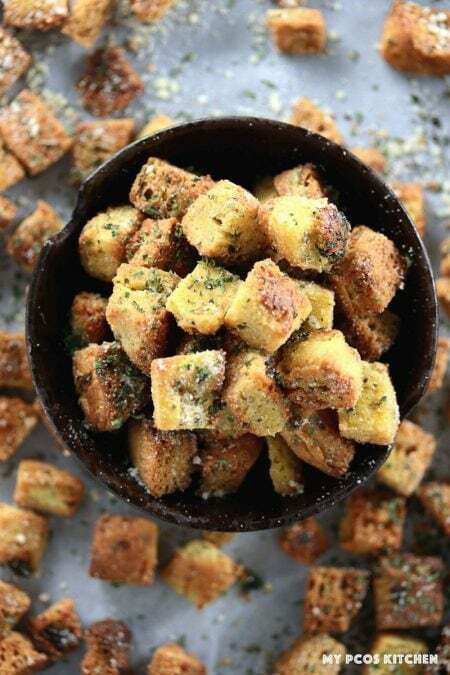 For this homemade croutons recipe, I used some butter, garlic, parsley and parmesan. You can alternate between different oils like olive oil or coconut oil if you wish to do a dairy free version. As for the spices, I definitely think you should add some garlic and a type of green herb. 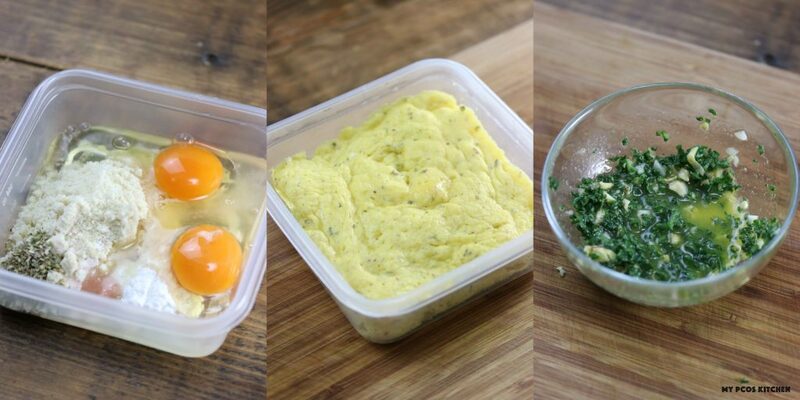 I chose parsley for this recipe, but you can use something like oregano, thyme, rosemary or even sage. Make sure that all of your bread cubes are nicely coated in your fat before adding the seasonings as they may have a hard time sticking to it! Having low carb croutons on hand can be pretty handy. Not only can you add them over any type of salad for crunch, you can add them over soups, stuff them in any type of bird, add them over pieces of meat or fish for crunch or even on pasta (low carb of course). Top them over this Shrimp Caesar Salad which uses this Homemade Caesar Dressing if you miss eating the traditional crunchy salad. An even better idea is to top them over this Low Carb Olive Garden Zuppa Toscana! When adding them to this soup you get an amazing crunch from the croutons and the bacon! That is heaven on Earth right there! 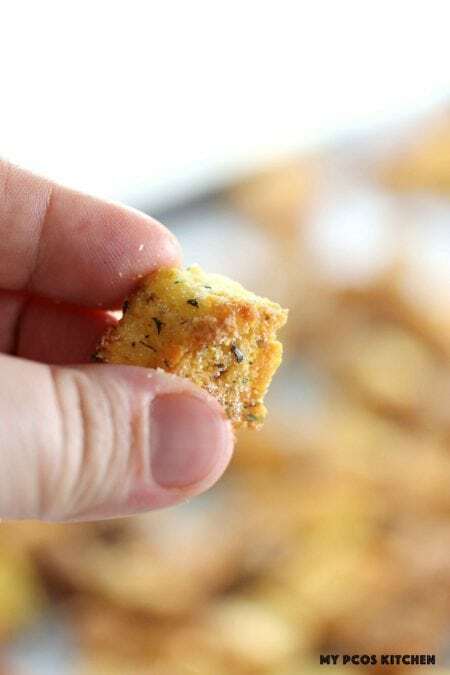 These delicious croutons are made in the microwave and are ready in less than 20 minutes! In a square tupperware (sandwich size) or any other heat proof dish you own, add all of the English muffin ingredients. Mix really well with a small whisk until smooth. Add the tupperware to the microwave and heat 3 minutes at 600W. After 3 minutes, if the center is still raw, add another 30 seconds until the center is completely cooked. Take out of the microwave and let it cool down a bit. Flip the tupperware over and take the microwaved bread out. With a bread knife, cut the square into two horizontally. Cut the two slices into cubes of your desired size. Add the cubes to a bowl. Mince the garlic cloves and the parsley. In a small bowl, add the butter. Put it in the microwave and heat until melted. Add the parsley, garlic and salt to the melted butter. Mix. Pour the butter all over the croutons and carefully mix with a spoon. You want to try and coat all of the croutons with the melted butter and seasonings. Add the croutons to an oven tray and make sure they're not piled up over one another. Add to an oven or toaster oven at 180C/350F and bake for 12-15 minutes, until golden brown. Take the tray out of the oven and let the croutons cool down completely before serving them. You can then add the parmesan if you want to use some! Thanks for the awesome recipe! I’ve made this twice this week and will be making it again. Instead of the oven though, I’ve been using my air fryer. (5 minutes at 360, stir, 5 minutes at 360) Might try using ranch seasoning next time for a crunchy snack. Just made these….OH MY TASTE BUDS!!!! WILL NEVER BUT croutons for making stuffing again. Made another batch using onion/scallions and instead of parmesan chees, I used a sour cream and onion popcorn seanoning. Eating this one for a snack. YUMMMM!!!!!! 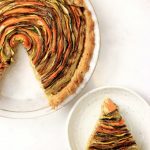 I’m allergic to nuts; what would be a good substitute for the almond flour and how much of it should I use? Hi Sue, you could try bobs red mill 1-1 flour? I substituted green banana flour( known fir its rich content of resistant starch- good for the gut microbiome)- needed about 4 tbs . After they were done,I popped them into the airfryer, they browned easily, were crisp and fabulous! 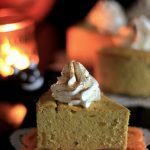 These are delightfully tasty and easy to make. I did add a TBSP more butter and threw in about a TBSP of grated parmesan in the mix. I checked halfway and stirred. Start watching carefully around 12 – 13 minutes. I think I would like to try these with some caraway seed next time to see if I can get a rye bread taste ! I’ve made something like this for a few years for Thanksgiving stuffing. Similar to cornbread. Everyone loves them! About 4-5 days in the fridge, but retoast them when you want to use them again. 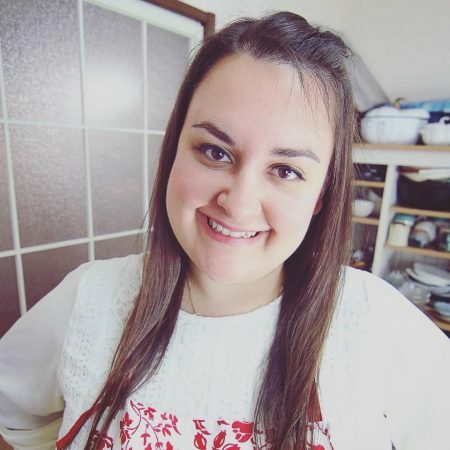 Could I use olive oil instead of coconut for the bread? Hi Stephanie, it should be fine! Can you also make it with unblanched almond flour? What do.you mean by serving size 1 portion? Is it the whole quantity that you made with the ingredients listed? Hi Iman, it’s 6 servings. It’s in the top of the recipe card where it says: Servings: 6 portions. So the nutritional info is for 1 portion. Made these and the flavor was great. I didn’t cut my bread in half horizontally so maybe that’s why they were not as crispy as Id liked. Next time I will bake them in a flat dish so they are thinner to begin with and won’t need to be cut in half. I cut the croutons into 3/4 inch pieces but will cut them smaller for more crunch! I dont have a microwave and still would love to try the recipe. Any suggestions on how to make this magic happen without a microwave? Hi Frederica, bake the English muffin for about 15 minutes at 180C/350F in the oven and follow the rest of the recipe! Hi Shawna what do you mean? It’s in the recipe card. It says English muffin and lists all of the ingredients and then the steps to make the bread and then the croutons. I have an oven. How much should be the temperature for initial baking of bread? Do you mean for the english muffin? I would say 10 to 15 minutes at 180C/350F until you can see that it’s not raw anymore. Once it’s cooked, cut it into cubes and continue with the process of the rest of the recipe.